Wow! This will be my 27th review for the year – and my last for this crew season. It has been a fun crew year, I hope y’all have enjoyed a view of the inside of different curriculum! My first start was to put the two workbooks into a small binder. 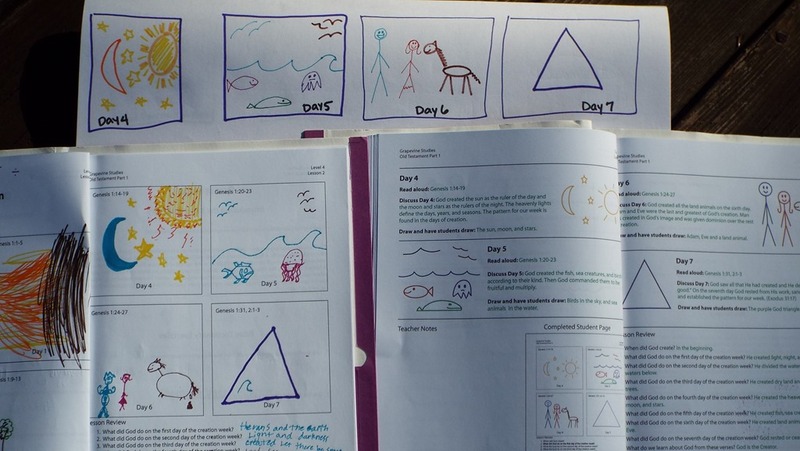 12 lessons are included in each of the Teacher and student books. The instructions direct you to draw out the lessons on a white board. Ours often holds the day’s schedule, drawings from Jon and signature check ins from friends who come over. So I used an 18×12 Drawing Pad instead. You’ll also need colored pens, markers, pencils, or even crayons. We like playing with fine pointed sharpies. The Teacher’s lesson guides you through the text of what to say. If you are completely unfamiliar with Genesis, there is enough text to help you. They encourage you to study the lesson in advance. Each day has a time line of images, guided by the text of Genesis. This book includes an overview of the timeline, then breaks down into sections of Creation, Adam and Eve, The Fall, Noah and the Flood, Tower of Babel, Job, Abraham, Isaac, Jacob, and a final review. 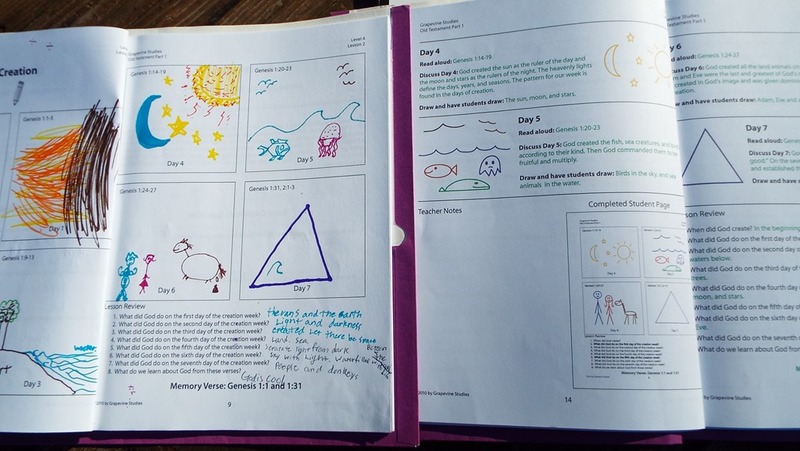 The lessons have Quest Pages, Timeline Review, Memory Verse Review, the Lesson, like Adam and Eve, and a Memory Verse and Lesson Review. We did a lesson a week, sometimes a page or two more. The text offers ideas of tools to use for the Bible Dictionary work, however, those tools have a copy write so the answers can not be shared in their student book. We are teaching the boys to use Blue Letter Bible, an app on our android phones and a site on line. We used these free tools for the study. Each day went fairly smoothly. Many days both of my boys worked along side each other. (14 and 18 yrs old). They really enjoyed looking up the words on the Blue Letter Bible. They also now enjoy being able to look up a subject and see what the Bible says about it, based on the verses that they find with the word in it. I wouldn’t say we learned a lot about Creation, at this age. It is a topic that is covered yearly in Sunday Schools. We are a literal 7 day Creation and literal Genesis Family. This is just straight Precept Bible Study style. What does the text say? Write that down. Look it up in a Topical Bible, a Bible Dictionary, a Bible Concordance, Answer a Question. The only source text, is the Bible. They only give observational questions to the text read. Since I come from this background, I would say that this is a non denominational type study. 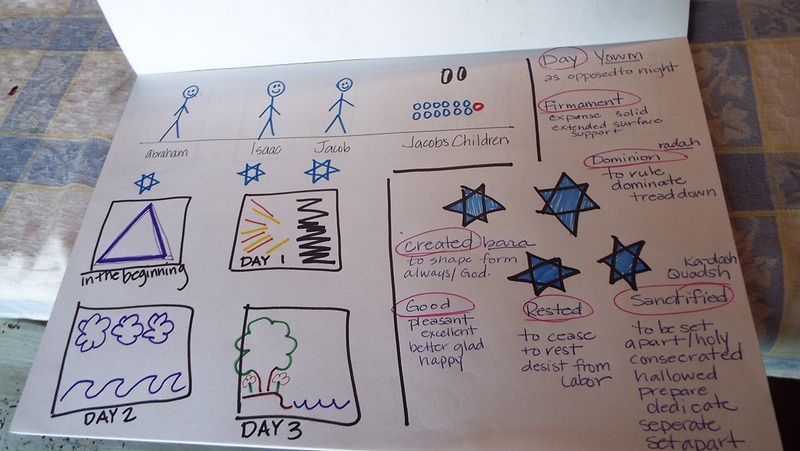 What we did learn was how to use the Bible Study Tools, which is the focus of this work. There is a quirk on the Teacher’s Guide. I noticed that these are from 2010 on the Copyright. So I’m not sure how many updates have been used. If you see a page example on the teacher’s guide there is a page number for the student text. Several of them are off, so if you are leading a class and say turn to page number 10, check their text first. Or if you are working off of an electronic copy, check it before printing. The other part was on the Student book, on their quest page, the text is the same as the teacher’s. “Today you will introduce your students to the first of the three Bible study tools. . .” The boys teased about it a bit of – speaking in the teacher tone. Nothing, on either count that could throw off a study day – but if you have literal style students, like mine, know it is there. Recommending it? I would say yes. I have many friends who as for a Bible Study curriculum, and I usually answer back – Well, have you tried reading the Bible? Snarky. I know. But I think this will help. I do feel like this was for a younger crowd, but the Word does not go out void, so we did get a lot out of our mornings. 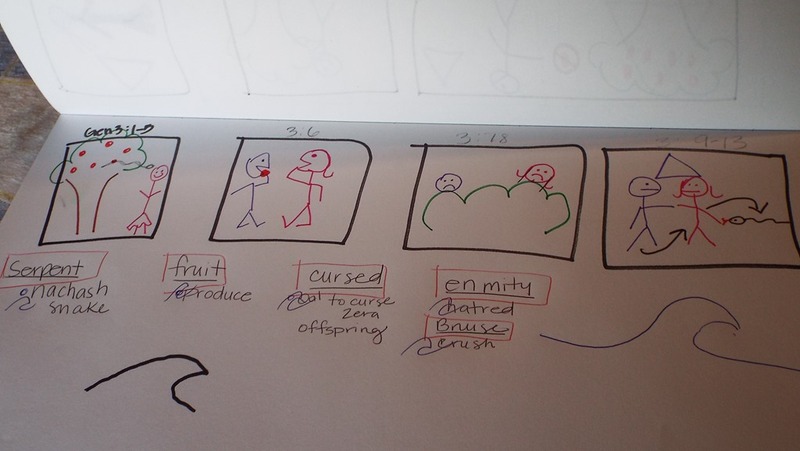 The drawing is easy and fun, my son took quite a few liberties at vamping up his squares, and the teacher’s text says to allow them to be creative in their drawings. A couple of days we even had the Teacher’s book out, and took turns being the teacher. 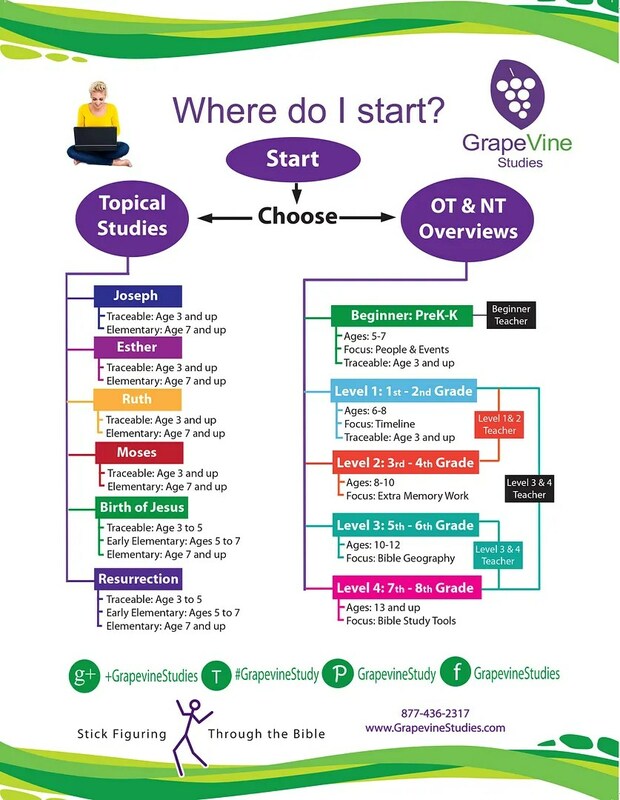 So if you do not have anything right now that brings you to the Word as a family – I do recommend GrapeVine Studies. 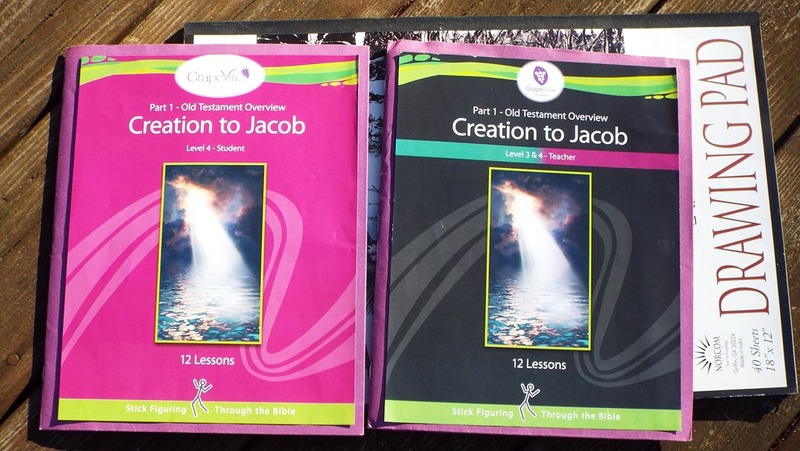 This entry was posted in Bible, Bible Thoughts, Reviews, Schoolhouse Crew, Some Schooling and tagged Bible Study, bible study tools, Curriculum, HomeSchool, hsreviews, precept. Bookmark the permalink.